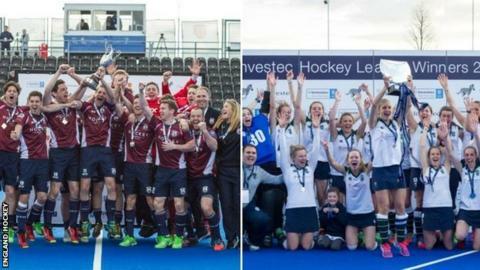 Wimbledon retained the Men's Hockey League title, while Surbiton won the Women's Hockey League for the third consecutive year. Both teams won their championship finals in a shoot-out; Wimbledon after a 1-1 draw with Reading, and Surbiton after a 0-0 draw against Canterbury. Surbiton's Abi Walker produced three saves in the shoot-out before Hollie Webb's calm finish secured victory. Phil Ball fired in the winner for Wimbledon after a thrilling match. Wimbledon's James Bailey and his Reading counterpart Tommy Alexander both saved four times in the shoot-out, which the 2015 champions eventually won 4-3 to claim a second successive title. Alastair Brogdon had earlier scored a 24th-minute equaliser after Tom Carson had put Reading 1-0 up.